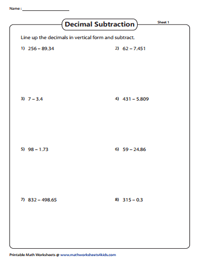 These worksheets emphasize on decimal line-up subtraction. A knowledge of grid subtraction and column subtraction will be an added advantage in solving these worksheets. 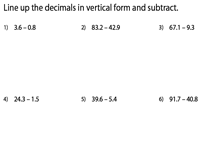 Classified based on place values ranging from tenths to millionths, this range of decimal worksheets gives the children elaborate practice in line-up subtraction. 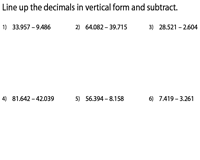 This subtopic consists of practice worksheets with exercises to subtract decimals consisting of tenths place value. 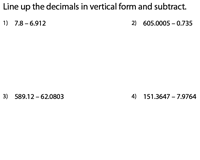 The objective of this set of line-up subtraction worksheets is to find the difference between two decimal numbers with hundredths place value. Enhance your subtraction skills with these line-up subtraction worksheets, dealing with the thousandths place. 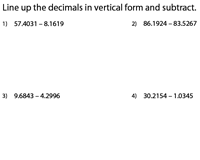 Reinforce the skills procured with these decimal subtraction worksheets consisting of exercises featuring varied place values on either side of the decimal point. 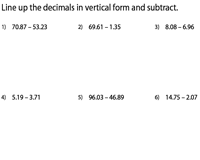 Refresh line-up subtraction with these worksheets, consisting of decimals in the ten thousandths place. 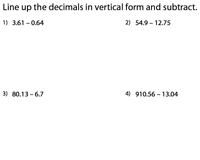 The purpose of this set of worksheets is to train the students to line up and subtract the decimals containing five digits in the decimal part. Level up with the worksheets here featuring exercises on subtracting decimals with six decimal places, and serve best as practice drills. 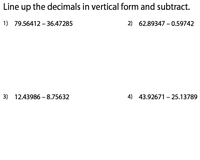 In this sub category, you will find line-up subtraction worksheets that encompass large decimal numbers with varied place values on either side. 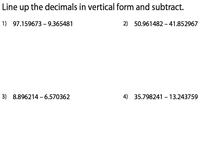 Test your skills by arranging the whole numbers and decimals in vertical form and then subtract.